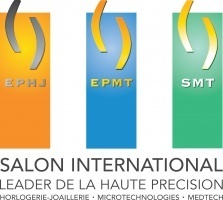 This Conference organized by Swissphotonics, the Swiss National Thematic Network (NTN) for photonics, will take place in the framework of the Salon International EPHJ - EPMT - SMT, the most important annual exhibition for Swiss suppliers of watch industry and micro technology. Multipurpose Laser machining with smart and new technical solutions together with real time monitoring for competitive fabrication processes are the future trends in keeping competitiveness. Examples and potential solutions for the future will be presented and discussed. The event will be of value to companies that are established in the sector or are looking to develop products there, as well photonics academics with an interest in industrial collaboration and commercialisation. Chacun doit soit s’identifier, soit créer son compte. Votre adresse e-mail fait office de login. Cliquez s.v.p. ensuite ici sur le site Swissphotonics en haut à droite sur Registration pour se registrer pour la conférence Swissphotonics. Everyone needs to identify or create an account. Your e-mail address serves as a login. Then click please at the top right of the Swissphotonics website on Registration to register for the Swissphotonics conferencs.